Sheffield Council believes that the findings of recent reports highlight that a city centre location for a proposed South Yorkshire HS2 station would maximise the economic growth in the North and add that the decision to select Meadowhall is based on an "outdated approach to transport investment." Construction on HS2, the high speed North to South rail link, will begin during this Parliament and has been given a funding envelope of £55.7 billion in 2015 prices. It should reach Birmingham in 2026 and Manchester and Leeds by 2033. Following the recent spending review, the Government pushed back a decision on the route through the Sheffield city region to autumn 2016. Whilst vocal in its support for HS2 coming to the city region, the Local Enterprise Partnership (LEP) has declined to commit to backing a specific site for a South Yorkshire station and instead has reiterated its stance that the location should be based on achieving the greatest economic benefit. The LEP and combined authority has commissioned a number of reports and masterplans from Pell Frischmann, BDP, Ekosgen, WSP and JLL, to help to determine whether Meadowhall or Victoria comes out on top. Sheffield Council has now published a summary case which draws from the, as yet unpublished, reports. It concludes that the "city centre option better delivers Government's priorities of the Northern Powerhouse and Transport for the North and avoids greater negative impacts of manufacturing and housing land," adding that: "this can now be achieved at no additional cost." Initial estimates had a station at Victoria creating more jobs and with more regeneration benefits than Meadowhall but with an additional £1bn price tag. HS2 Ltd now confirm that in their latest assessment, that differential has already fallen substantially to £680m. Reports indicate that a city centre location would deliver 6,500 more jobs, 1,000+ new homes, and £2bn - £5bn more GVA. As HS2 Ltd analyse the potential city centre route, it is now acknowledged that the additional journey time dis-benefit for the city centre option is just two minutes seven seconds, not the seven minutes previously estimated. Whilst highlighting Victoria, the council report picks apart the Meadowhall decision, arguing that it was based on the benefit to South Yorkshire rather than to the Sheffield city region. 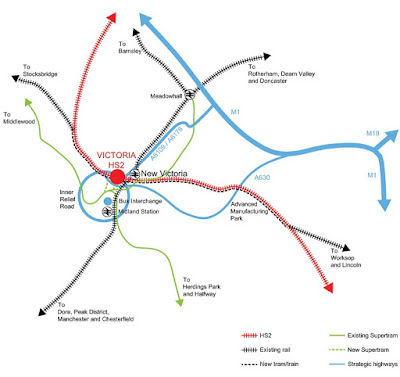 It states: "With a strong connectivity package, Victoria can open up more Sheffield City Region commuting connections, such as from Worksop, thereby linking more people into more and higher value jobs and creating a stronger, more integrated Sheffield City Region economy." It discusses issues of congestion around Meadowhall and that users of the HS2 station there are more likely to use a car to travel there, as well as physical constraints around the proposed site, adding that high value jobs "are far less likely to locate next to a constrained M1, a biomass plant and sewerage works." Consultants also believe that 90% of HS2 demand is from Sheffield city centre itself. Sheffield also argues that, as proposals are now being developed for HS3 - a TransNorth high speed rail link connecting the North's great cities - it would be illogical for HS2 going to an out of town parkway station whilst TransNorth goes to the city centre. The report states: "This would be an absurdity and a major opportunity lost. One part of Government policy would actively undermine another." For Rotherham, the reports show that a station at Victoria would add a further five minutes to journeys to connect to HS2 from Rotherham. Rotherham town centre is just six minutes by rail from the interchange at Meadowhall and a number of transport connections exist, or are currently under construction (heavy rail, tram train, BRT). A potential rail link to Rotherham via a "New Victoria" station adjacent to the HS2 station has been discussed. Consultants Parson Brinkerhoff and HS2 Ltd have identified feasible and deliverable alternative routes via the city centre instead of the Meadowhall section. Importantly for Rotherham, these routes would avoid going straight through the site of the Waverley development where developers, Harworth estimates that the proposed route to Meadowhall would affect 1,000 of the 4,000 proposed homes and enterprise zones are being stifled. With HS2 Ltd moving the proposed Leeds station into one city centre hub location, Julie Dore, leader of Sheffield City Council, said in the foreword of the latest report: "Sheffield City Council, alongside many local and national supporters are convinced that the proposed High Speed Rail station in Sheffield City Region must be in the city centre, not at the currently proposed out of town parkway location. "Our arguments are not driven by a pre-determined view of one location over another: I have always been clear that my support for HS2 is conditional and based upon maximising economic growth in the North. I will not compromise on this position, particularly in light of the new evidence outlined in this summary which is so clear in its conclusions." 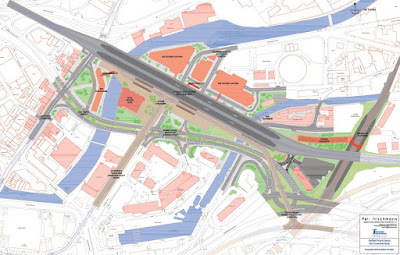 Reports from HS2 Ltd respond: "Sheffield Meadowhall remains the Government's preferred station location. However, we recognise the arguments put forward for a city centre station in Sheffield and we continue to explore them. We are committed to ensuring that HS2 delivers the largest possible benefits and continue to work with local partners to ensure that Sheffield city centre will benefit from HS2. 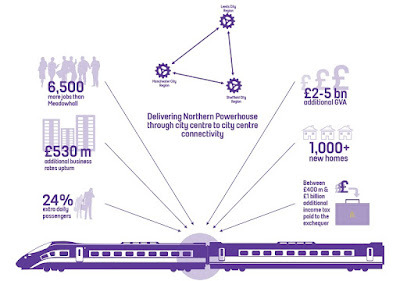 "We are working with the National Infrastructure Commission (NIC) and Transport for the North on the possible interfaces with Northern Powerhouse Rail." "The Government intends to make a decision on the location of the HS2 South Yorkshire Hub in autumn 2016." Typical self important Sheffield.Rotherham will benifit far more with station near Meadowhall.Hope our council have some balls and throw a spanner in plans for station in Sheffield centre.Its time for them to put Rotherham first!!! Strange how a site that supposed to support and promote Rotherham as so many that like to see wonderful Sheffield put before Rotherham.I actually work in Railway industry and am almost certain that if we ever see the HS2 (Which i think personally is a massive waste of money which would be far better being spent on upgrades to the network we have now),the station will be at Meadowhall any,as the logistic and massive additional cost of putting it in Sheffield will rule this out.So sorry Sheffield,the areas HS2 station will be at Meadowhall,cliser to Rotherham than Sheffield!!!! Did you actually read the article? Rotherham needs a successful Sheffield. A Meadowhall station is good for no one except a few Chinese tourist wanting to shop in a big mall. The extra 5mins on the train into Sheffield will be nothing compared to the wait at the Meadowhall platform watching all the trains that don't stop in their way to and from Leeds. The best way for every one is to not create a HS2 station in the region, but create a by-pass from the main HS2 line into Sheffield Midlands Station. Although costs for upgrading the existing classic rail, it would leave money for upgrading and extending the tramway and classic rail connection into the wider region. Sheffield is the brand. In Amsterdam Airport and Paris Airport the Robin Hood Doncaster airport is simply named Sheffield airport. Doncaster Robin Hood airport has the connotation with a Disney Amusement Park.And nobody outside the region has ever heard of Rotherham or Doncaster. Use your distinctiveness in the region to brand it internationally with Sheffield to better compete on the global market. And please stop the parochial thinking! I agree with the above, sheffield is the brand and a strong sheff is a strong rotherham! I think that the best option hasn't been mentioned by anyone! Use the victoria station BUT, make a spur onto an upgraded sheffield-worksop line, and fly the new lines over the meadowhall lines to the victoria site! From there, use the stocksbridge branch line (upgraded) then tunnel under grenoside back out! This requires much less money than any other scheme while not screwing sheff over in any way. Rotherham will also benefit, as the tram train from rotherham can be run through the station. If we get this with a higher frequency, along with local rail, we can make this work!